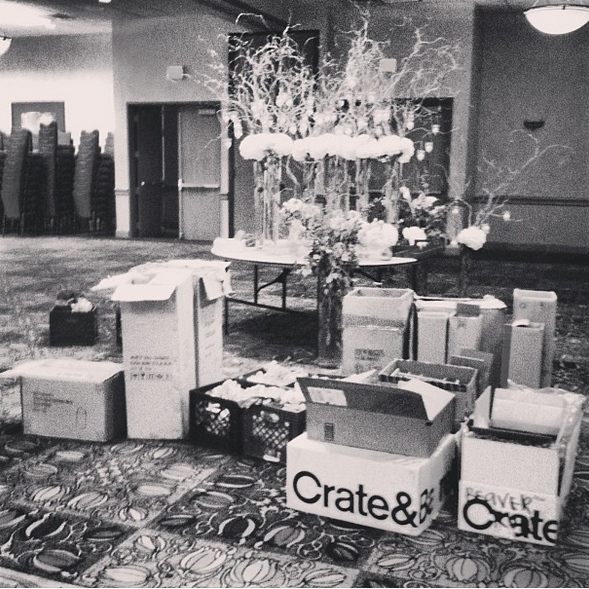 The day after the wedding and event rentals. A lot of couples are decorating their weddings with a team of bridesmaids and family members, but sometimes forget to think about the day after the wedding and the event rentals. This is an easy one to overlook, however, on busy weekends, some venues have vendors remove all items from the reception room that night. Is that something you want your guests to be doing at 11 o'clock at night? It takes me about an hour to pack everything up and put it in the car. Then, another hour to drive and unpack. Or, if your venue is flexible, you can send some folks over the next morning to deal with boxes, glassware and leftover flowers. My suggestion to you is to consider a wedding planner, and to make sure that they will return the next day to grab any items left behind. Not all wedding planners will offer this, as they won't always live in the vicinity of the wedding, and need to return home to tend to families. Ask us how we can help fill in the blanks when it comes to the details like this. It's not hard, but it will take time. We can help figure it out.